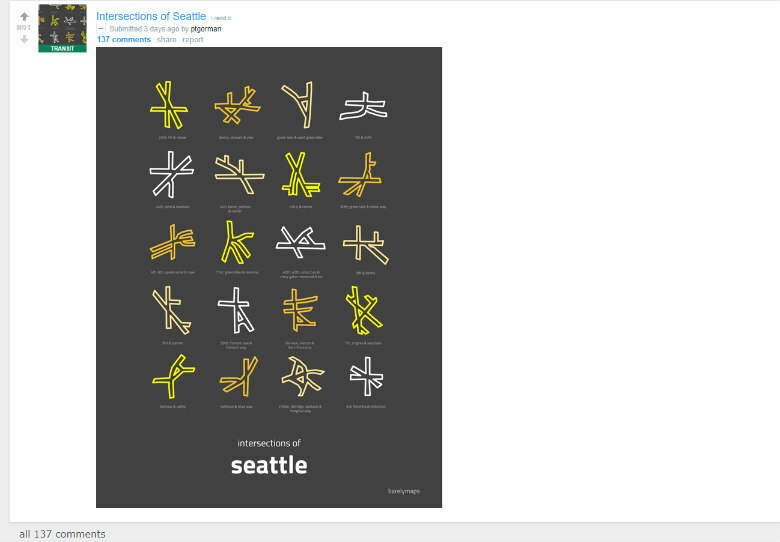 Our frustrating intersections are actually quite beautiful. Social media erupted after artist Peter Gorman posted this on Reddit. Whether you’re a native or recent transplant, at some point you’ve likely pulled up to a Seattle intersection and wondered if the city’s earliest engineers are trolling us from the grave. Sure, our hilly terrain and abundant waterways present unique challenges. But why must some intersections look like a “jacked up” yoga pose called the “downward facing arachnid,” as a couple Twitter jokers put it? Fortunately, a local man’s art might help us laugh off the dashboard-pounding rage we feel whenever Siri tells us to go “straight” at an intersection shaped like a Chinese character. Since at least 2015, Seattle-based artist Peter Gorman has found beauty in maps, turning them into cool regionally focused prints he peddles through his Etsy shop, BarelyMaps. This week one of his prints lit up social media after Gorman posted it on Reddit. With a little imagination, Gorman’s print is a modern Seattle Rorschach test. Maybe you see the Chelan-Delridge-Spokane-Marginal Way layout as a pterodactyl sea turtle, cloud swimming above South Lake Union’s cranes. Or perhaps the Queen Anne Drive-Raye Street/4th Avenue exchange is the logo of Capitol Hill’s next failed sustainable microplate restaurant, Fork & Twig. Or maybe you just like staring at neat squiggly lines. Either way, peep Gorman’s Etsy shop and if you like what you see, toss him a few bucks for a print.